Emotional Intelligence Is Important For Success – Competitive Edge, Inc.
Bill Gates, John D. Rockefeller, Walt Disney and Richard Branson are a few of many examples of brilliant, successful men who failed miserably or underachieved in the classroom, but still managed to achieve great success in their careers and lives. However, despite this and other convincing evidence, society has persisted in believing that success in school equals success in life- or, at the very least, in the workplace. Does a high intelligence quotient (IQ) necessarily mean you will have the ability to set and achieve your personal and professional goals, whatever they may be, in order to be successful? All five factors are reflections of EQ. You might have the most knowledge of anyone around with the highest IQ, but if you can’t convey that information to other people, how useful is it? All the creativity and skills in the world don’t matter if you are unaware how you relate to others, and if you behave disdainfully, angrily, or impulsively no one will stay around long enough to admire that creativity and skill. 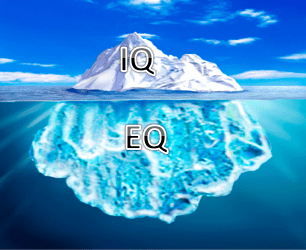 The good news is, while our IQ and our natural behavioral styles are “static” traits and rarely change much throughout our lives, EQ is a “dynamic” skill which can be improved upon by training, coaching, and experience.